Jeanette Neagu was an active environmental activist for many years until the Syrian conflict evolved to what it is today. That’s when she shifted the focus of her activism to the refugee crisis and helped mobilize the Concerned Citizens for Syrian Refugees (CCSR) with other community members. Recently, the CCSR organized a dinner to raise funds for Syrian refugees through Zakat Foundation of America (ZF). 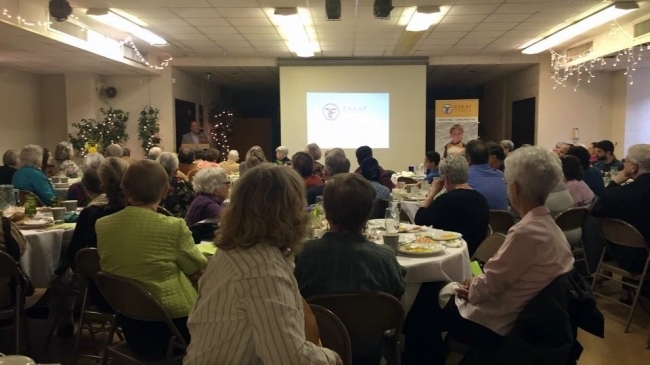 The dinner attracted over 200 people and was held at the First Presbyterian Church in Michigan City, Indiana. By the end of the night, over $12,000 was raised, which will go towards food packages that will be delivered to refugees in Gaziantep, Turkey, as well as to refugee camps within Syria. “It was a deeply moving event to see so many coming together to help those suffering from the biggest humanitarian crisis since World War II,” said Neagu. “It was truly a multi-faith gathering of people of good will.